The Mineralogical Society of New South Wales ("Min Soc NSW") promotes knowledge and enjoyment of mineral science and mineral collecting. The Society was founded in 1975, and includes both professional and lay people interested in mineralogy. We hold monthly meetings, and also organise field trips. Along with other Australian State Mineralogical Societies, we participate in the publication of the Australian Journal of Mineralogy. We meet on the first Friday of the eleven months February to December unless that Friday is before a long weekend or is itself a public holiday, in which case the meeting is put back until the second Friday. Meetings start at 7.30pm. Visitors are very welcome. See list of future meeting dates and topics below. 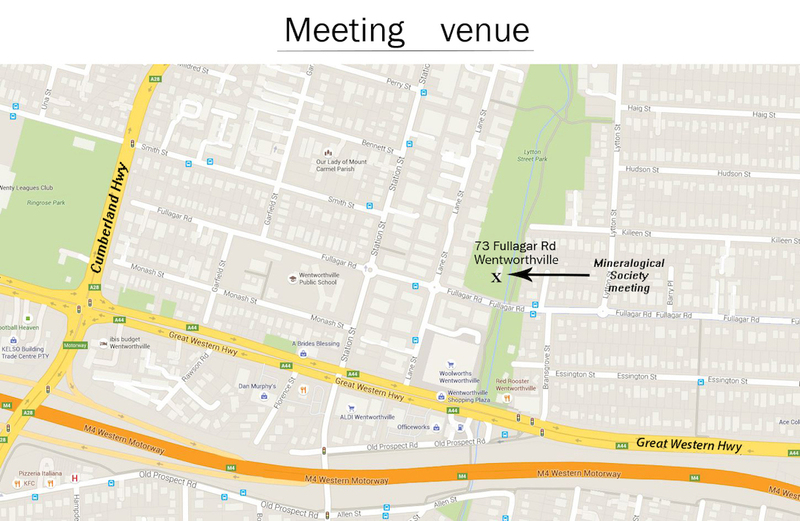 Meetings are held in the clubrooms of the Parramatta and Holroyd Lapidary Club at 73 Fullagar Rd, Wentworthville - see map below. Subject to circumstances some changes to the following schedule of program subjects and speakers may have to be made in due course. There will be a mini-talk to be given by Dieter Mylius on the Kyloe Copper mine near Adaminaby and a lecture given by Mellissa Murray on ‘Magnificent Minerals in Museum collections: The Albert Chapman Collection. The program for the June Meeting is not yet finalised. There will be a lecture given by David Colchester on ‘Why Rely on Nature When You Can Make Your Own Minerals’. There will also be a report to be given by Paul Meszaros on : - ‘The NSW Economic Rock and Mineral Collection – Latest Developments’.